Bashir’s rule has been challenged by nationwide protests that erupted in December 19 in the northeastern city of Atbara against worsening living conditions, and quickly escalated to demand the removal of the president — who has been in power since 1989 — from office. Reports by human rights organizations and local activists say that more than 50 people have been killed during the protests, which have spread to the cities of Port Sudan, Gedaref and Nyala in Darfur. Bashir’s backhanded remarks on the protests that rippled across the Arab world in 2011 have generally been left uncontested by Sisi, who, in a joint press conference with Macron a day later, said that the Arab Spring was “followed by chaos,” in response to questions from French journalists on Egypt’s worsening human rights record. In the same presser, Sisi added that the Arab Spring was designed to bring about the rise of Islamist rulers all over the Arab world, a sentiment that Bashir — who is associated with political Islam, and whose longtime rivalry with former Egyptian President Hosni Mubarak, as well as Sisi, has often been described in Egyptian media as stemming from their opposition to his Islamist tendencies — could hardly share. Yet this standoff stopped short of preventing Cairo from supporting the Sudanese president over recent weeks. According to the official, this is partly due to the Egyptian state’s sensitivity toward any form of popular dissent that threatens governmental control. That Sudan’s protests have been triggered by economic hardships is another source of unease for Egypt, which has been implementing a tough set of austerity measures since it signed a $12 billion loan agreement with the International Monetary Fund in 2016. “But, of course, we can’t compare the economic situation in Egypt to the economic situation in Sudan,” the official stresses. The source, however, alludes to the fact that Egypt’s support of Sudan is not unconditional. “[Egypt is] already stuck with a tricky situation in relation to the [Grand Ethiopian Renaissance] Dam, which is bound to affect its [annual] share of the Nile water. For the longest time, [Egypt] was dismayed at Sudan’s reluctance to help — now, we feel like Sudan would be more willing to cooperate with us in the tripartite talks,” the source says. Egypt and Sudan, the two downstream nations of the River Nile, have been embroiled in talks with Ethiopia since 2015 to reach an agreement over their annual share of water in light of the construction of the dam, which has a reservoir slated to hold over 70 billion cubic meters of water. Sudan had, so far, sided with the Ethiopian proposal that Egypt’s share should be decided upon annual basis, depending on rainfall estimates. Moreover, it has accused Egypt of appropriating Sudan’s share of Nile water, while Egypt has fought to keep its annual share at the level determined by the 1959 Nile water agreement between the two countries. The Egyptian official says that, based on Bashir’s visit to Cairo this week, the latter signaled that Khartoum will now support Egypt’s water sharing demands. Egypt does not mind being on the same page with its regional archenemies, Turkey and Qatar, in regards to supporting Bashir, the source says, arguing that countries, at times, agree with their rivals and disagree with their allies. 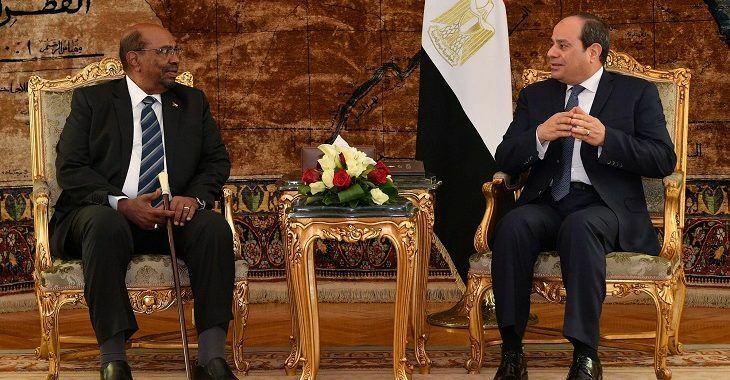 However, another Egyptian official says that Egypt is monitoring Bashir’s weakening position with growing trepidation, particularly following Qatar refusal to provide the financial support the Sudanese president requested during his last visit to Doha in January. For their parts, Saudi Arabia and the United Arab Emirates are already exploring options for a safe exit for Bashir, as well as a potential successor, according to the official.